Lecler is a unique silky sheet mask, enriched with powerful active ingredients of Hyaluronic Acid, Peptides and Anti-oxidants, to give you a beautiful, radiant and healthy looking skin. 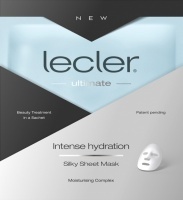 ‘Suffuse, Contour and Immerse’ is how the face masks uniquely hydrate the skin. A delicate combination of thin cotton fabric and silk makes the fabric of each face mask to ensure there is added degree of comfort and ease to wear, while it gives a cocooning effect to the skin. Designed for easy movement, Lecler 20-min hydrating application lets you get on with the rest of your day while you let your skin absorb all the goodness of its active ingredient-rich serum.